So one of the projects was fixing a shift I had sitting around from a pirate larp a few years back. It was originally sown very very quickly – part of it was only overlocked together. The sleeves were too snug, for it to be comfortable. So I decided to fix it. I added a small V shaped insert in each of the sleeves and now it works really well. I probably isn’t the proper way to construct it, but I like it. I also gave the parts of the dress that still didn’t have proper stitches one. I have not embroidered anything since my school days. I want to do the edge of my tunic but I wanted to take some baby steps into the world of embroidery so I did some blanket stitches on the edge of the shift. I think I want to do the edges of my tunic as well now. It is 28 C here, so that is why I am red like a pig in all the pictures. I have been eyeing tutorials of how to use lucets on pinterest for quite some time and today I needed two cords for an apron that I am making. It turned out to be pretty easy easy with the use of a video tutorial by Evelyn Skae. 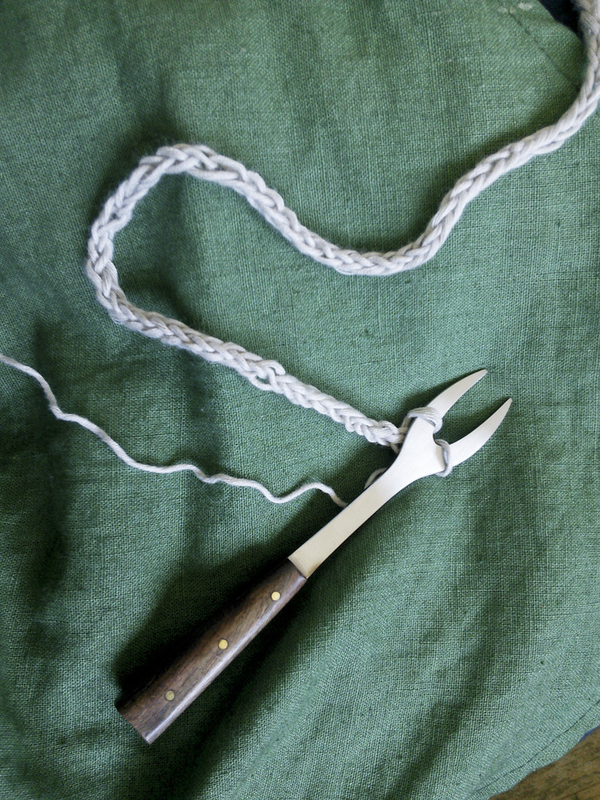 After making the first cord on a faux medieval fork, I decided that i wanted my own, so I went down into the apartment garden, into the bushes and found a stick with a fork in it. My boyfriend made one with some knife magic and half an hour later I had my very own lucet. It is a bit harder to use than the fork, but has the distinct advantage that I don’t fell silly using it and the yarn don’t try to escape every other second. 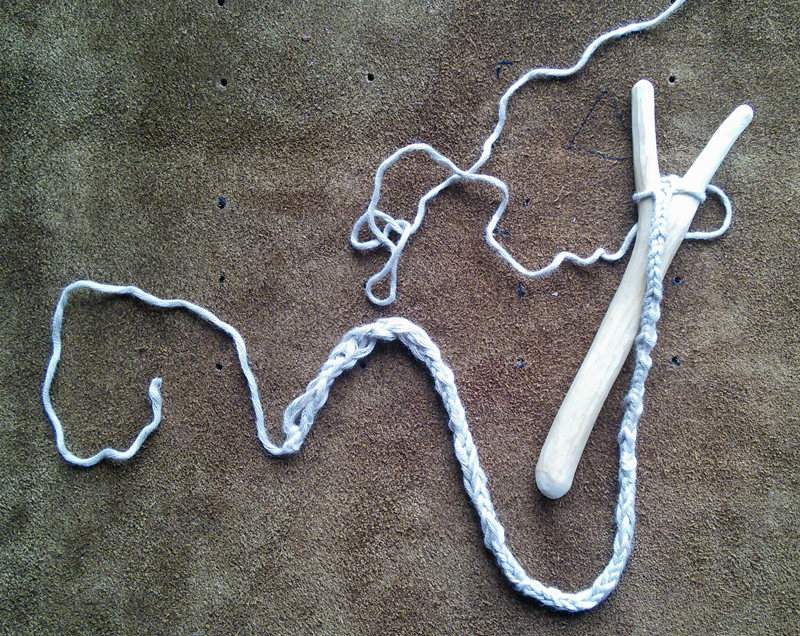 I am half way making the other cord now. I decided that I wanted to do at least one crocheted item for my outfit. As it happened I ended up with two. I made a narrow green belt for under my tunic, to hold up my accessories (a wooden cup, pouches etc) and a wider patterned one. The wide one is my first attempt at to crochet anything with a pattern in it. It is made with double crochet and slip stitches. All the pieces of my outfit other than the hat is homemade. My outfit right now is: A mid calf full linen skirt. A green linen tunic. 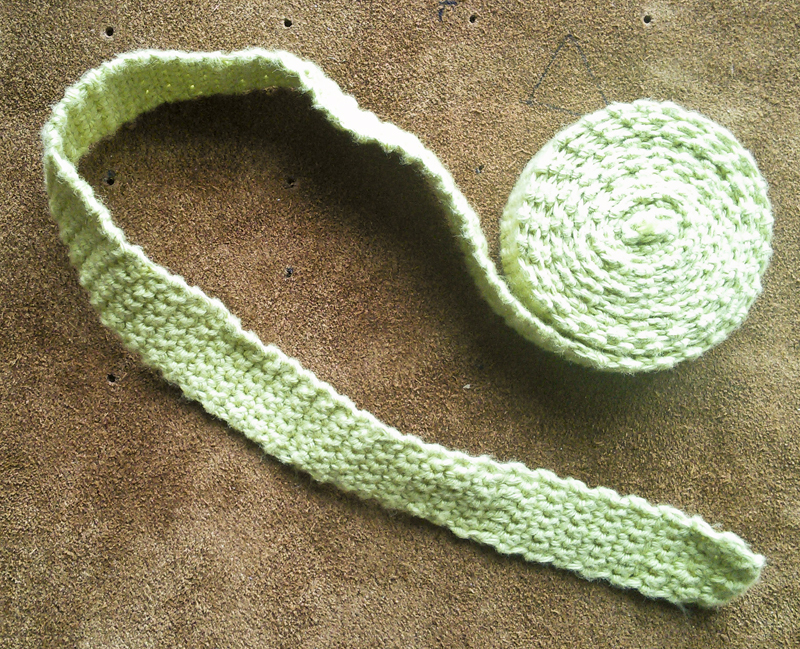 A crochet belt. The cream cotton shift that is now a little different from this picture. I plan to add a set of faun ears I bought on etsy and the apron I am working on. 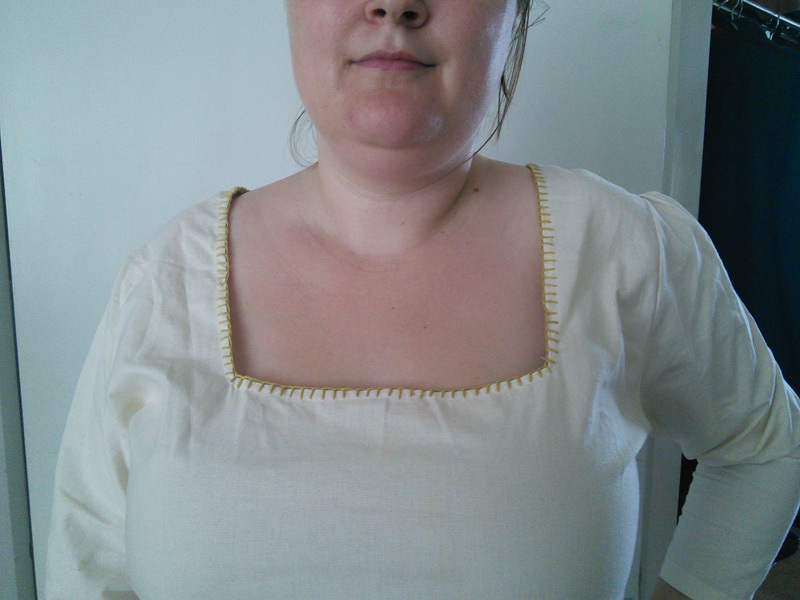 I also have an alternative chemise that I coloured my self using onion peels. I just don’t have a picture right now. The tunic will get some embroidery details when I get around to it. It looks a little unfinished. I am also planing to do a belt purch from some of our leftover leather from other projects.